West Arc Welding is pleased to provide you with mobile welding. Our convenient service is quick and efficient, directly at your doorstep. Whether you need us to come to your home or business, we bring our modern, mobile technology, equipment, and talents to you! Being mobile means we can provide you with expertise and greater convenience. Rather than going to a workshop to have your repairs done, when a welder comes to you, we can easily fix what needs to be done – quicker and without other repairs getting in the way. This means that we also can get a better appreciation of anything that you will need customized because we are able to see the setting and usual location of what we’re working on. Sometimes, it can take weeks to get a job done when you drop it off at a workshop. With mobile welding, the job is completed on the spot. No distractions – only your work getting our individual attention at the location of your choice. Most welding shops have set hours, one facility, and limited space. We can accommodate your schedule and location, saving you time and money in the long run. 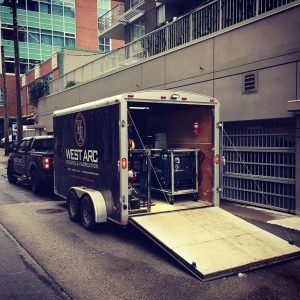 Mobile welding service provides portable equipment to service your automobiles, restaurant equipment, castings, steel, stainless steel, aluminum, magnesium, copper, or other metal equipment repairs. No problem is too small or big, whether you need us to repair your neighbour’s mailbox that you accidentally backed into or fixing a hole in your backyard fence, we have you covered! Contact West Arc Welding today for more information. We specialize in executing quality and time efficient projects, at reasonable rates.